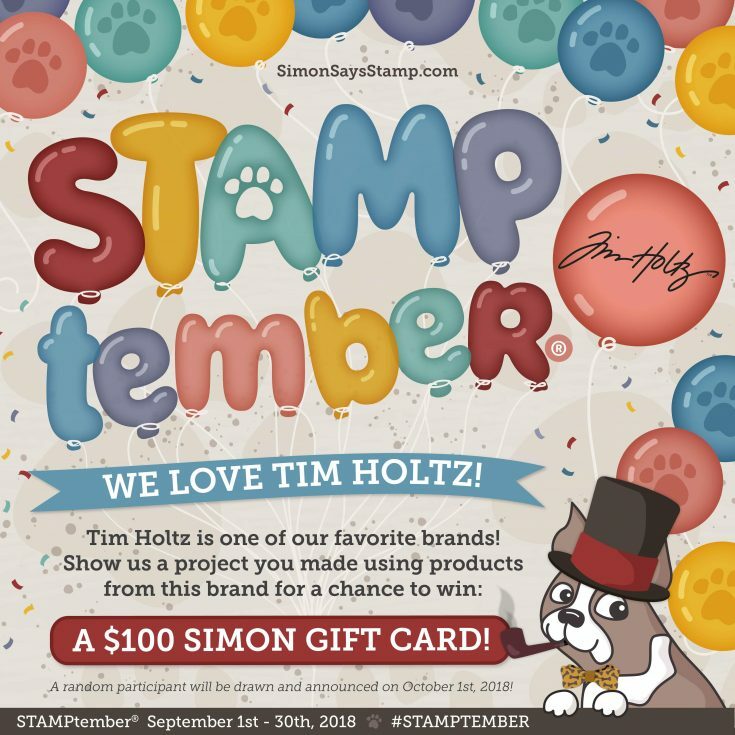 Home | Blog | STAMPtember® Exclusive Limited Edition: Tim Holtz! 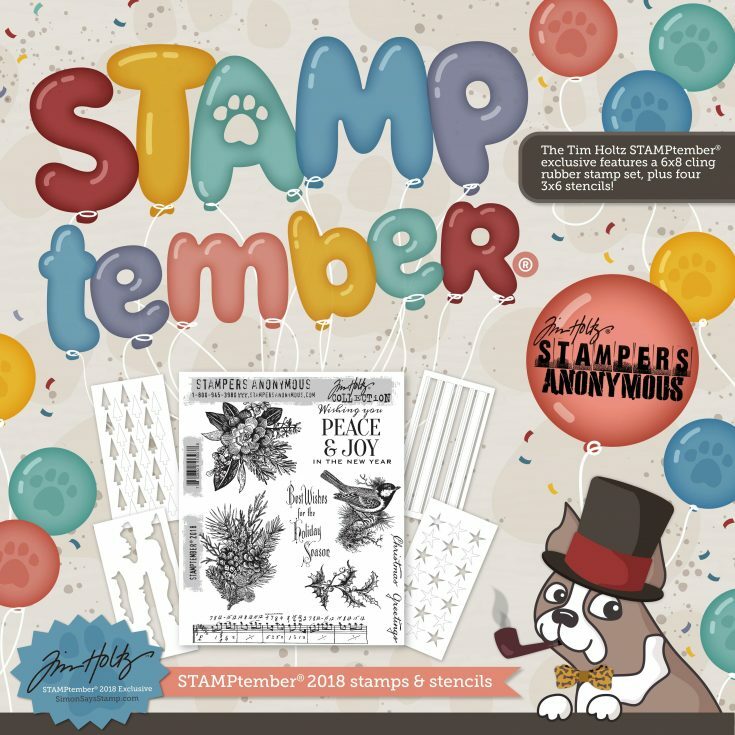 STAMPtember® Exclusive Limited Edition: Tim Holtz! Oh my gosh, friends!! Ever since I got a sneak peek of this AMAZING Tim Holtz STAMPtember® exclusive I’ve seriously been counting the days until we can reveal it to you! Isn’t it GORGEOUS?!!?! The super fun icicle and shifter stencils, in addition, are just the icing on this fabulous cake! 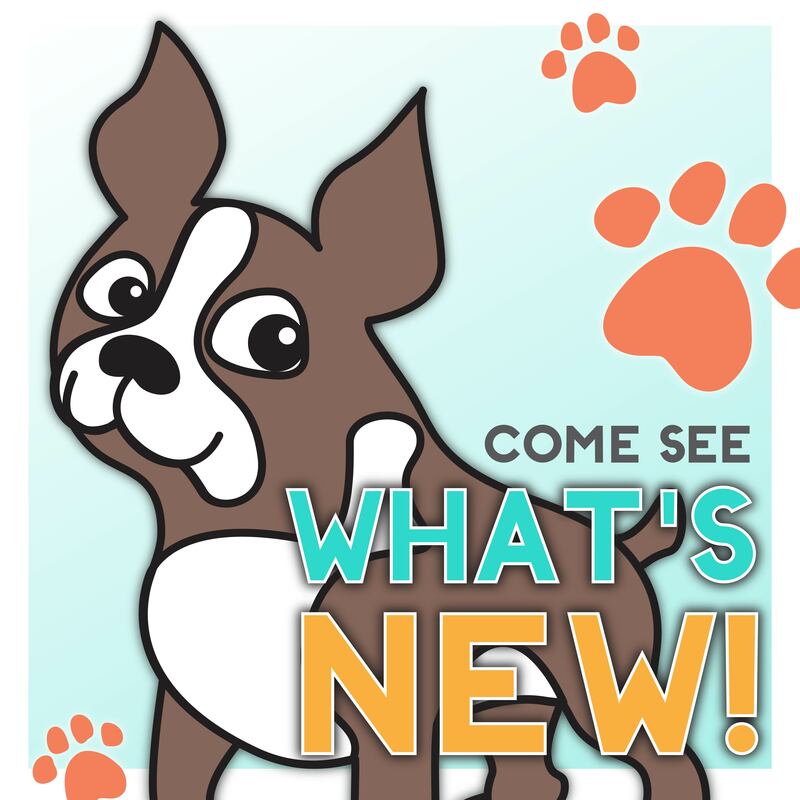 Tim will be going LIVE on Facebook today at 1pm ET to showcase the products and beautiful projects created using the stamps and stencils. I cannot wait to see. Be sure to tune in! Shari Carroll made two STUNNING cards to celebrate this new exclusive set! Don’t miss her video on how she made them! We love Tim Holtz! 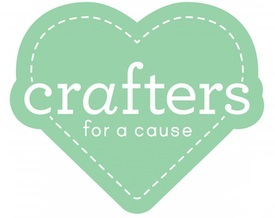 Show us what you’ve made with their products for a chance to win a $100 Gift Card to our store! 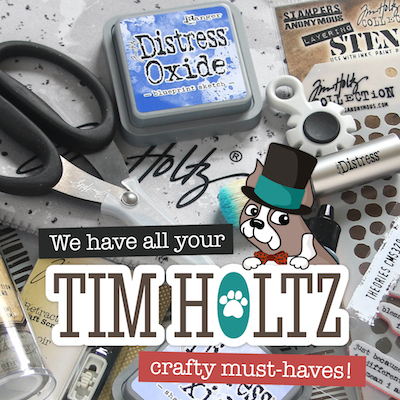 Show us a project you made featuring ANY Tim Holtz products for a chance to win a $100 Gift Card to our store! Winners will be announced on October 1st! Wow! I can feel the wintery icy cold in these beautiful creations! Oh Shari, these could NOT be more stunning, so beautifully done! These cards are amazing! So pretty! OH YES – this was what I was hoping and waiting for!!!!! Wow! He’s done it again–more great holiday stamps that are a joy to use! 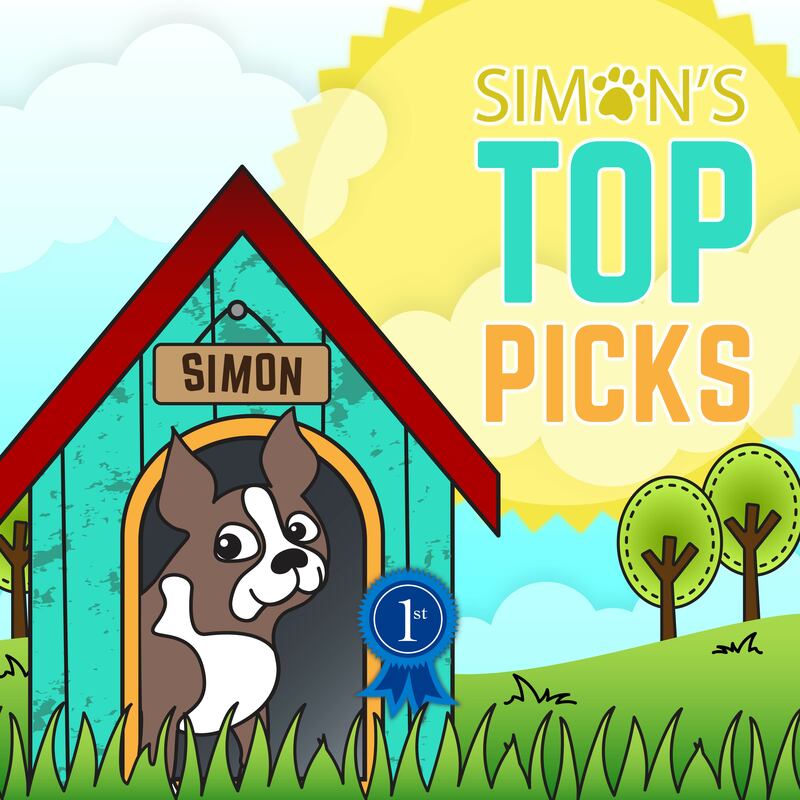 Thanks for sharing these lovely card examples and video. Wow, your cards and the color combination on your cards is gorgeous! 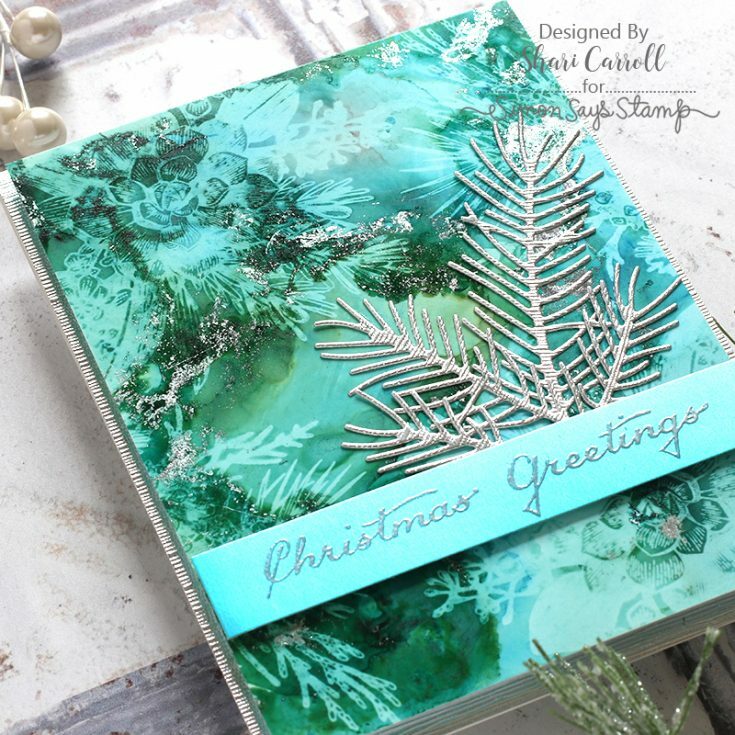 Tim Holtz is amazing & this set has done Stamptember proud. Ordered along with some other items: one that was back in stock that was out of stock previously & another I had forgotten when I ordered the Mama Elephant Merry Mail set. Rcvd Mama Elephant Merry Mail yesteerday & will play with it today. 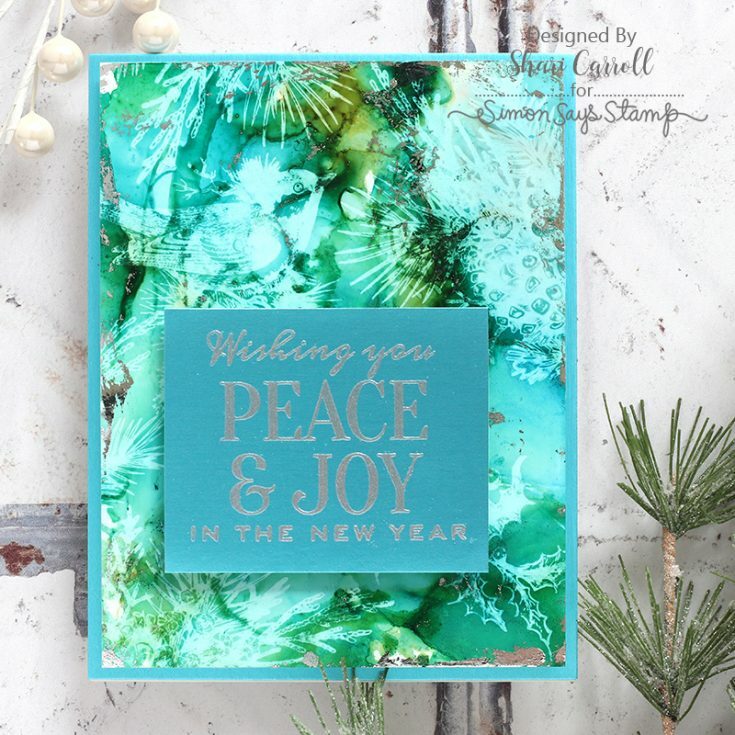 Stunning cards, Shari! Love that you showed how to use the foil – definitely want to try that. A quick question…why use both 99% alcohol and alcohol blending solution? Hi Daria, the Alcohol creates more of a watercolor look and washed the colors our a bit more than Blending Solution. Wow!!! Amazing cards!! <3 Tim Holtz!!! Wow beautiful cards! Great kit! Thanks for sharing! You make it look so easy to create such visually stunning cards! Just gorgeous! 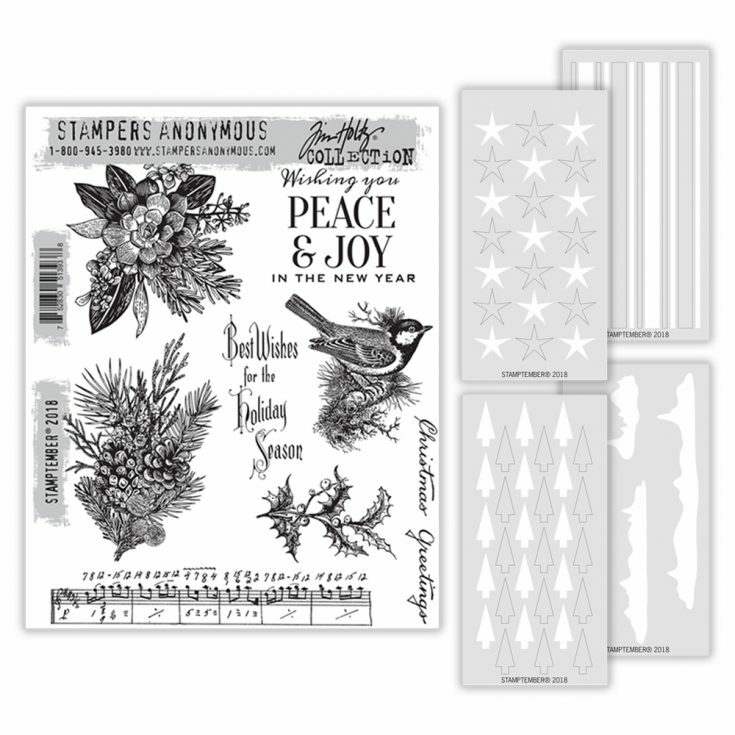 Tim Holtz does it again with the perfect stamps and stencils and ink products! Wonderful cards with this holiday set. 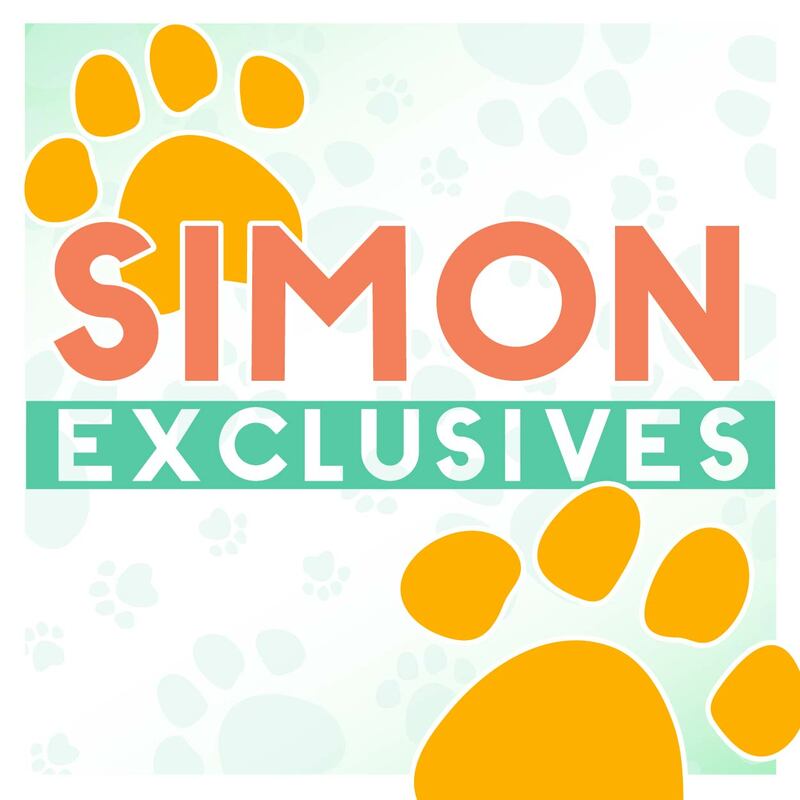 Oh my this is an amazing exclusive!! How exciting! Shari’s card are stunning!! :) Glad to grab this one! Amazingly beautiful backgrounds. I don’t normally watch videos, but this would be worth it. Stunning! thank you for the inspiration! I haven’t used alcohol inks yet. Too bad the October card kit is out of stock. I hope there will be more available for sale because it is a good way to test out this product, being a part of an awesome kit. I love your technique of applying foil with the use of the tacky alcohol inks. It is one way of extending the life of left over foil. Thank you for the tutorial! These may be the most beautiful cards ever with an alcohol ink background. The colors with the silver are perfection and Tim’s designs with Shari’s talent are amazing. 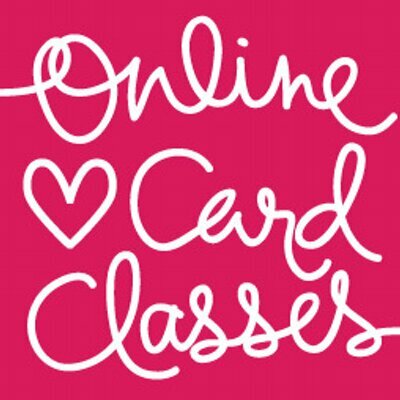 All of these cards are stunning, lovely to watch the video and just great to see Tim in action again…I just love his excitement and enthusiasm for the products and how thrilled he is to look at cards made using his stamps.I have just ordered the set and will be bouncing like Tim once they arrive at my house. Thank you for sharing videos and cards with us, much appreciated. This is such a great set! And I love Shari’s cards! Wow, I need to get this stamp set! Love it! I absolutely love these cards!!!!! thanks for the video. would love to find the dies to cut the pine leaves is that availiable from simon says stamp? wow! So beautiful. I never would have imagined that enough of the alcohol ink would be sticky enough to hold foil, and that it would stay after it had dried. What a wonderful discovery! 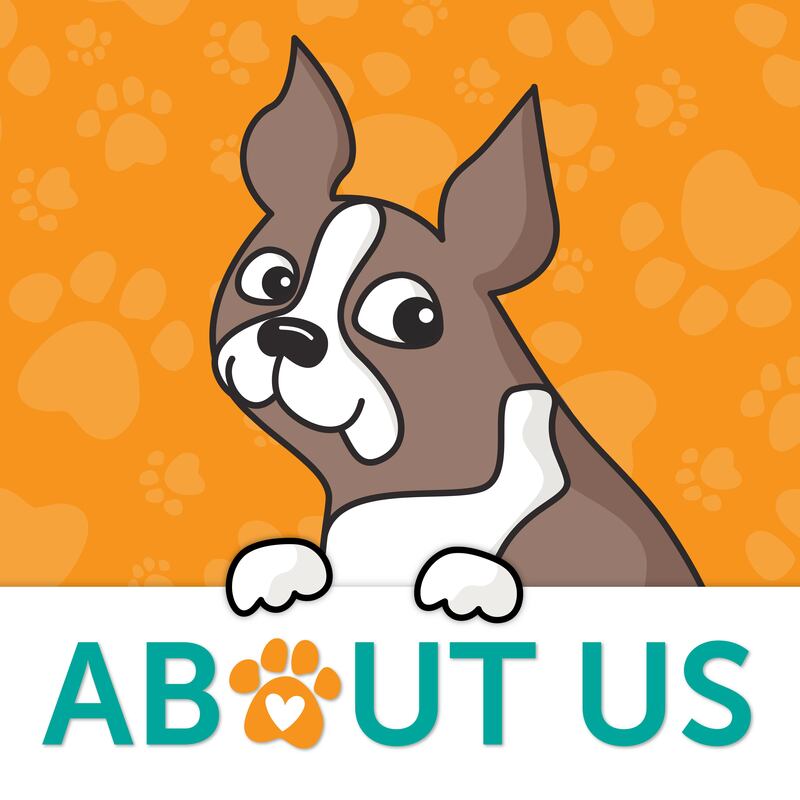 how do you submit a card – i do not have a blog or website! Great cards Shari, love to watch the alcohol technique, everytime it’s an other outcome. I admired your cards already yesterday with FB Live by Tim Holtz. Thank you for your time and effort to show this to us and have a great weekend. These cards are stunning. Thank you for the video showing how you made them. Shari your cards are simply stunning! TYFS. What a fabulous stamptember release this is. Awesome card and stamp set. Thanks for sharing. These cards are perfection!!!!! They are so pretty and not difficult, I’m so glad I purchased this set! Beautiful! I’m loving that alcohol lift ink, so much fun and so many things to do with it. Thanks for the great inspiration. Beautiful card:) Thanks for the inspiration and for the great challenge. NEW Inspiration and a Walkthrough of Friendly Frolic on FB LIVE!